Be sure your HEPA Wet/Dry Vacuum is full unit certified! A lot of companies claim to have a HEPA vacuum, but many are not full unit certified. If an EPA inspector walks onto your job site, and your HEPA vacuum does not meet the standards, they can shut you down or slap you with a fine up to $32,500. 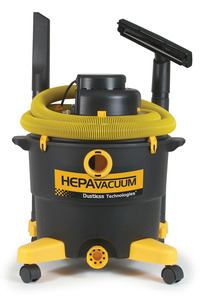 The HEPA Wet Dry Vacuum from Dustless Technologies is HEPA certified, and it provides many benefits you won't find in any other vacuum system. Check out our regular Wet Dry Vacuum to see the impressive array of other features. The HEPA Wet/Dry Vacuum is ideal for renovation contractors who have to comply with EPA regulations covering lead paint removal. The EPA specifies the use of a carpet head with a beater bar so be sure to order the optional HEPA Head™ carpet head. Its beater bar is powered by the air flow of the vacuum. One of the big advantages of the Dustless HEPA Wet/Dry Vacuum is the optional Wunderbag™ Micro Pre-filter that greatly extends the life of the HEPA filter. The Wunderbag™ is an inexpensive disposable filter that captures the vast majority of the dirt and dust before it reaches the more expensive HEPA filter. In fact, the Wunderbag™ captures particles down to .5 micron. That’s remarkably close to the HEPA filter that captures particles down to .3 micron. The Dustless HEPA Wet/Dry Vacuum gives you a distinct advantage by enabling you to switch from dry to wet operation without worrying about getting the valuable HEPA filter wet. A protective baffle/wall inside the canister, protects the HEPA filter from water at all times. The Wunderbag™ also retains its strength when wet, unlike other bag pre-filters, which is a huge advantage when switching between wet and dry operation.